The stars of forthcoming comedy film Destination: Dewsbury. The director of a new movie set in North Kirklees has said he hopes the title will raise the profile of the region. 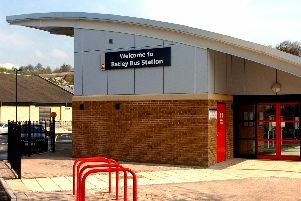 Filmed across locations in Dewsbury and Batley, Destination: Dewsbury is described as a light-hearted caper comedy described as a Brit-flick cross between The Inbetweeners and The Hangover. And up-and-coming London-based director Jack Spring, who was just 22 at the time of filming, said that he chose to set the film in Dewsbury in part because of an 'interesting' perception of the town. "I was first introduced to Dewsbury when I went to watch London Broncos play against the Rams there as a teenager," he said, "it became a bit of an annual pilgrimage for me. "When the ideas began to take shape it just felt like the right aesthetic to me, we looked at a few other Northern towns and this just fitted brilliantly. "The location manager was outstanding and found such fantastic places - pubs, cafes. And everyone was so welcoming." Young filmmaker Jack Spring has celebrated the generosity of spirit shown by the people of Dewsbury and Batley. The eagerly-awaited movie, which follows the journey of four friends back to the town they grew up in after hearing bad news from a schoolmate, was filmed in late-Summer 2016 - in the months following the murder of Jo Cox. Jack said the warmth and generosity shown by locals was incredible - far beyond anything he had experienced in other parts of the country. "Towns like Dewsbury and Batley are famous for certain things, I guess," Jack said, "and they're not always the most positive. "So many good things happen in those areas and the national press are wrong to associate the place with negative connotations. "Having spent a bit of time there, that was a reason we wanted to film and set the movie in Dewsbury. We want to help get rid of that negative press." The film will have two premieres - the first on Saturday 23rd February at the Showcase Cinema in Batley, and its UK capital touchdown on the 24th February at the Prince Charles Cinema in London. Producers are hoping the film will have an extended run at Batley, leading to a wider release in cinemas across the UK. Jack said: "We want people to get behind it. It's a film with Dewsbury at the core of it - it's in the title! We hope people love it as much as we do."